One of the city's most exclusive and prestigious private men's social clubs, the Knickerbocker was founded in 1871 when some members of the Union Club became concerned over a relaxation of admission policies at that club. In 1913, the club commissioned this clubhouse from Delano & Aldrich. Its red-brick, Georgian-style design is very understated. While attractive in terms of color and scale, the building's exterior detailing is not extraordinary and a rooftop addition is rather ungainly. The interiors are handsome, but conservative and not exciting. The sidestreet entrance leads to a staircase up to the main floor on the second level. The club, which has high ceilings, is noted for its food. A nice component of the design is the setback, walled garden on the avenue frontage. For many decades, this property was abutted to the south by another Georgian-style structure, the townhouse of Mrs. Marcellus H. Dodge, a dog fancier who kept a large garden surrounded by a wooden fence at the northeast corner of 61st Street and the avenue adjoining her midblock mansion that was sold in the 1970s and redeveloped as a luxury apartment building that was built flush on the avenue with a large midblock plaza. "This firm often combined historic American Colonial and English Neo-classical forms, creating deceptively simple buildings, as which the Knickerbocker is an early masterpiece. The flat rectilinear wall planes of brick laid in Flemish bond are punctuated by large multi-paned windows and enriched with the subtlest of ornament. A meticulous restoration was completed in 1992." The same architectural firm designed the larger and more attractive Colony Club two blocks to the east at 564 Park Avenue, which was completed in 1916 (see The City Review article). 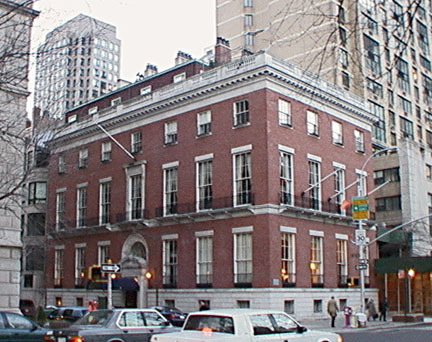 It also designed the Union Club on Park Avenue at 69th Street.